My dad was born in Indiana and I never really thought about why or how they ended up in Indiana. In fact, as a child, I thought that my dad must be an Indian, since he was born in Indiana. While visiting Grampa, I finally remembered to ask. Both Peggy and Bob worked and needed help with their children. My grandfather was working in California at Davies Auto, but wasn’t doing what he wanted to be doing. So when Peggy and Bob asked if Grampa and Gramma could come to Indiana they jumped at the chance. Gramma took care of the children and Grampa went to work at the factory. The factory shut down at the end of the war to convert back to cars and Grampa decided to return to California and Davies Automotive where he became a mechanic and worked for several years. Livermore-Amador Genealogical Society reminded me that I need to update my goals... Thanks for the reminder. I hadn't looked at them since JUNE. 1. Write up what I know of John Shelton.- Not done yet. 2. Write up what I know about Laura Wilkinson.- Check. 3. 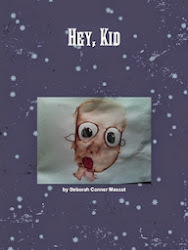 Write up what I know about William Mason Conner.- Still working on it. 4. Fill in some blanks about Thomas Conner.- Still working on it. 5. Write the Mariani history as I know it.- Still working on it. 6. Source all of the above.- I’m sourcing as I go. Easier that way. 8. Find descendents of William Mason Conner.- found some on Facebook and sent emails on others. Next is regular mail. 9. Teach a home school class on family history for young children.- Begins next month. 10. Toss all of the above to 2012's list when I find something really exciting on some other line that wasn't on The List.- Check! 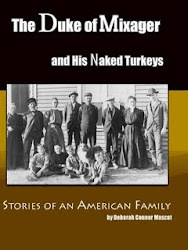 500 pictures and as many stories from Grampa have made me drop everything to write, "The Duke of Mixager and His Naked Turkeys. The Stories of an American Family". My great grandmother’s brothers, Clem and Henry, were among other things, very tall- well over 6 feet and racing to 7. They were farmers and landowners, as well as railroad workers. 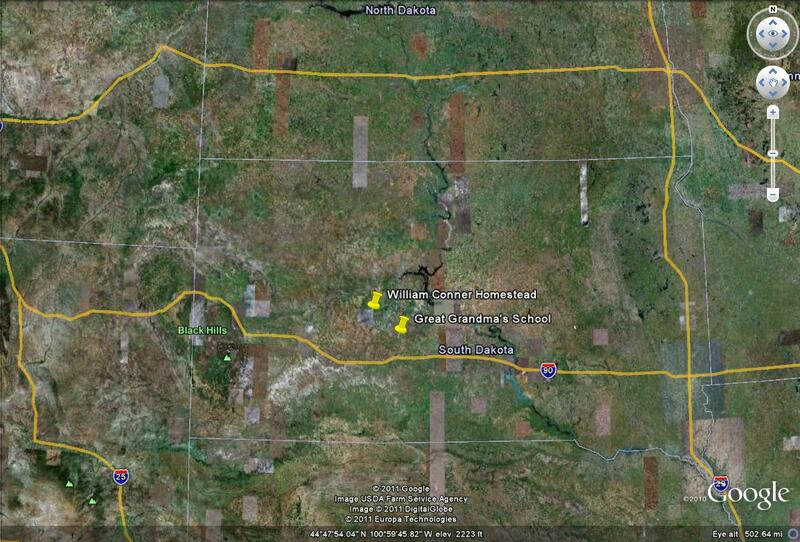 When Henry and Clem were 23 and 17, respectively, they were “haymaking” in Aberdeen, South Dakota. In 1920, Clem married Ora Belle Saxton in Philip, South Dakota and in 1921, they experienced both the birth and death of their daughter Clara. She was born April 10 and died October 10 that year. In 1922, Clem married Alice Rose Griswold and the next year, their daughter Dorothy was born. They had a son, Paul William, in 1925 and a daughter Dorris in 1925. Closed to camera is Tony Konst. Two other tallest are Henry and Clem, Tony's sons. 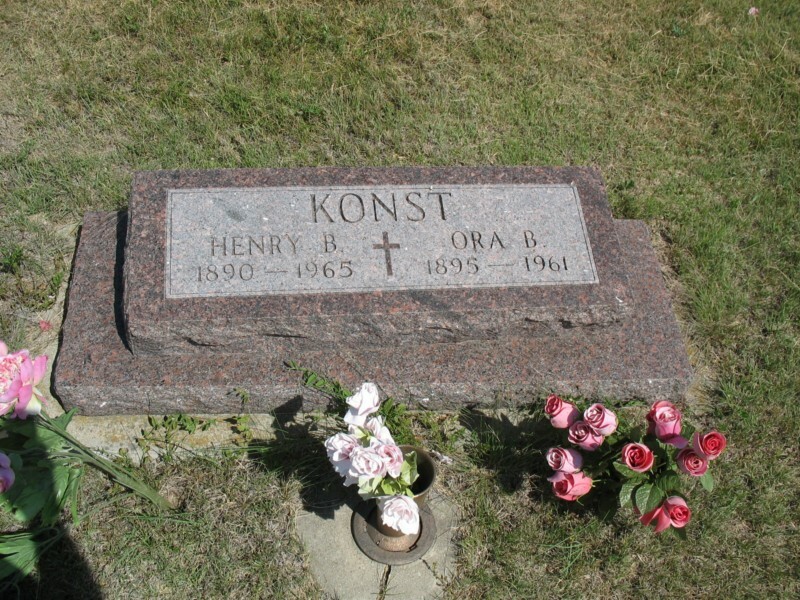 After the death of their father, Henry and Clem had a falling out over the land and, despite living in the same small area of South Dakota, didn’t speak for years. You see, Grampa’s father was half Scottish and the other half was a little bit of a lot. 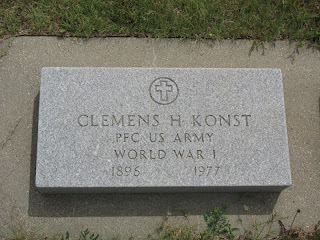 Grampa’s mom’s family (Uncle Henry's, too) was German. All German but with a possible hint of illicit Native American. While I grew up thinking I was Indian because my dad was born in Indiana, I really didn’t know about the whole possible Native American connection. But apparently on Great Grama’s death bed, she whispered, “There is some Indian in us.” Coming from California in the 21st Century, it’s difficult to imagine that being anything but awesome, but times were different in the homestead years and some things were apparently not something the family was proud of. But all I have to go on for this illicit Native American is a death bed statement, a tease from Uncle Henry about Grampa being named Pierre for a French Indian, and a story from Grampa’s childhood. When he was a boy, his grampa, Tony Konst, took him to the Indian Reservation. They went into a tee pee and all sat in a circle and the men smoked a peace pipe. Grampa doesn’t remember where this was, but he remembers thinking that it was important that they were there and that his grampa was important to these Native Americans. So was Tony’s mom or dad not who we think but actually a Native American? Or were Tony’s children those to first house the possible Native American DNA? 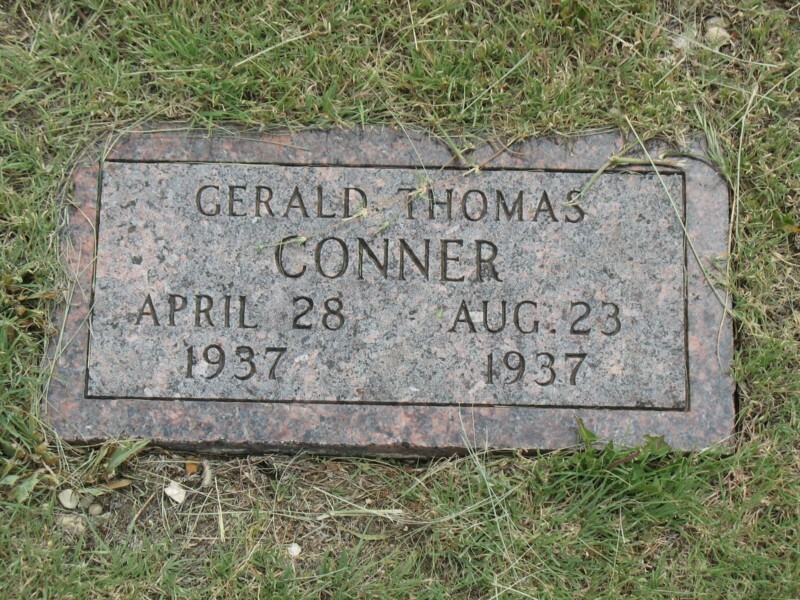 At some point during their time in Capa, South Dakota, my great grandfather, Orville Thomas Conner, decided that he was going to be a turkey farmer. They rented a farm outside of Capa near the Badd River and bought 60 baby turkeys. They raised them to adulthood on that farm south of town. One day, a cyclone came through the farmlands. After they safely emerged from the cellar, they went to check the livestock. The turkeys were nowhere to be found. They searched and searched until they heard an odd noise down by the river. Looking up, my grandfather and his sisters saw the turkeys in the trees. But they looked odd. Something was amiss. The tornado had plucked their feathers right out. The turkeys were naked. They finally came down from the trees to eat, but sadly, died in just a few days from sunburn. Faced with 60 rotting dead turkeys, Great Grampa had to quickly perform a mass burial. But where? He looked around the place and remembered the hole that tended to retain water after the snow melted each year. He decided that if he buried the turkeys there, and covered them with enough dirt… well, two birds with one stone (so to speak…). So Grampa and Great Grampa, using a scoop made of a half-barrel looking piece of metal strung up to the horse, dug and dug and dug. When they thought they were done, they dug even further, just to not hear, “I told you so!” from Great Gramma. And that was that with the turkey farm. 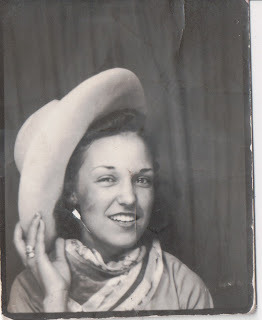 This is my great grandmother's sister, Christine (Konst) Houdek. She was born 24 May 1888 in Iowa and died 14 Nov 1969 in Garner, Hancock Co., IA. She was married to Anton Houdek. So the summer when he was 15 years old, Grampa and one of his friends, Clarence Petorski, drove the priest the 1,850 miles to Salem, to stay with his family for the summer. They stopped by my grandfather’s grandfather’s house in Russell, Iowa, where this picture was taken. The next summer they did it again, only this time, using the brilliance that only a 16-year-old can pull off, Grampa talked the priest into letting his friend Pete come along. Pete knows how to fix things, said Grampa. Remember that trouble we had with the car last year? Pete could fix that! So for two summers, a car of teenagers and a Catholic priest road-tripped to Salem, Massachusetts where they stayed at 3 Milk Street. The priest had a non-priestly brother who worked all day. Grampa and his friends would impatiently wait all day for the brother to get home and then they’d all head to the Salem Willows. This beautiful wooded and hill peninsula jutting out into Salem Harbor became a municipal park in 1858. Graced with majestic, 200-year-old white willow trees, Salem Willows, a public park since 1858, has a special place in amusement park history. In 1906, Everett Hobbs & William Eaton offered Americans the first ice-cream cone; “Blind Pat” Kenneally introduced Spanish “double-jointed" peanuts to America from his cart at the Willows. Bavarian woodcarver Joseph Brown created the famous Flying-horse Carousel in 1866. in 1945, the horses were sold to Macy’s Department Store in New York City , where they graced the famous Macy’s Christmas displays. While the original horses have been replaced, the carousel itself still offers a thrilling ride. A young Duke Ellington played here in 1923; Count Basie and Louis Armstrong performed as well, at the old Charleshurst Ballroom, now the Willows Casino. A tradition of popular summer jazz concerts continues to this day; jazz vocalist Cassandre McKinley performed here in 2003. I also asked Grampa how he and Gramma met. Grampa’s best friend Harry (who he was friends with for over 70 years) was dating Grampa’s sister Harriet. Harriet was working in a hospital in the Black Hills and my grandmother Signa worked with her. She’d come down to visit and bring Gramma with her. Or Harry and Grampa would go up and visit. Before Harry went off to the war, he and Harriet were married. 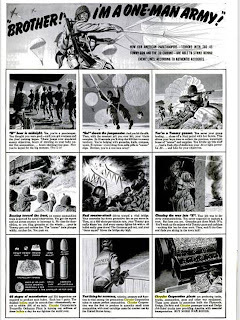 That didn’t last beyond the war (Grampa told me several such stories- should be a lesson in there for the future). But Gramma and Grampa lasted a lifetime. My grandmother, Signa Felt, was an engraver for Hewlett Packard in Palo Alto, California for many years. All the HP equipment had plates with writing that was done by my grandmother or her team. She even did the plaque on the front of Mr. Packard’s boat. My grandfather also worked at HP for a time. He was in production and then a master scheduler. 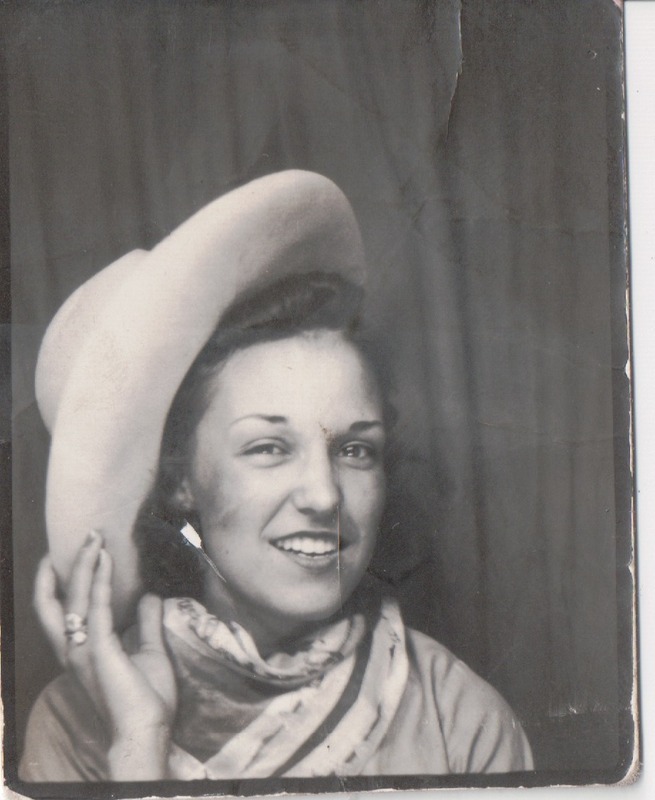 My grandfather’s sister, Fern, married a guy named, Johnny. I called him Uncle Johnny and although he was a bit gruff, he was the kind of man that looked you in the eyes (even when you were six) and told it how it was. You believed him and when he smiled at you, you know it was because you were awesome. Or at least he thought you were. My Grampa told me a story about Uncle Johnny’s Uncle Pierre (Jean Pierre Origer). Uncle Johnny (and Uncle Pierre) were from Illinois. Uncle Pierre was a sort of a hobo in those days, living wherever, doing whatever. He would disappear for months, even years, and then just pop up again. During this time, Uncle Johnny and Aunt Fern had an orchard in Cupertino, California and one day while my grandfather was visiting, Uncle Pierre just popped in on them in California after months of being gone from Wisconsin. He said he was in San Jose and heard the name “Origer” in “Origer Orchards” and so decided to see if he was related. He stayed awhile and told some tales. The kid in me finds this tremendously exciting. I think it did to Grampa, too, as he mentioned him a couple of times and then got as excited as I did when we found a picture of Uncle Pierre. The Monday Mystery is what were some of those awesome tales. I sure hope someone knows. 10 years ago today, I turned my computer on and it started, as usual, on the AOL home login screen. Where I could put my id and password, was a big picture of the first tower on fire. I woke my husband and we went to the television to CNN and saw the second tower hit. While it seemed far removed from me way out in California, it still hit in a big way. For one thing, we didn’t know if it was over or not. For another, it was US. Suddenly, for a few days, the “US” abbreviation for the United States stood for US. All of us. Together. Despite republican or democrat. We were reminded that the American flag was something to be proud of. I remember driving to work and all the overpasses were filled with people waving the flag. At work, we dragged out televisions and radios so we could keep up. Around ten, our boss decided we were needed at home with our families so he dismissed us. I remember worrying about him crossing the Bay Bridge to get home. I went home and watched CNN all day for that and the next few. Slowly things went back to normal for us out here in California. We go to work. We come home. We eat, sleep, play. We laugh, cry, rejoice. We even forget. But each year, on 9/11, we remember. I asked my grandfather how his parents met, as I realized that I had no idea. I wish I’d asked my great grandfather when he was alive, but alas, I was too busy being a sullen teenager. Anyway, at least I got the story now. 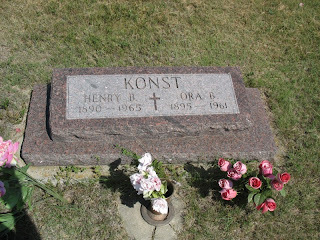 My great grandmother Anne Ellen Konst was a school teacher for awhile. 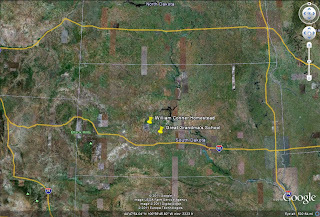 Her school was halfway between Midland and Capa, South Dakota. Because it was 5 miles in either direction, she lived in a little house behind the school. In rural areas, sometimes the most you had was a few people in each township, so they would get together in the schoolhouses for dances. 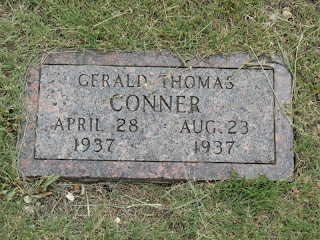 My grandfather, Orville Thomas Conner, came from his father’s homestead out in Ottumwa (about 10 miles to the train and then another 10 or 12 miles on the train) for a dance at my great grandmother’s school. Now, Grampa didn’t tell me if it was love at first sight or anything, but look at these two?!?!? Don’t you think it was, since they were married for 61 years. This meme came from Tonia’s Roots at http://www.toniasroots.net/2011/09/09/99-genealogy-things/ . I agree with her that this could be a good Bucket List starter. Joined a group on Genealogy Wise. Spoke on a genealogy topic at a local genealogy society/local library’s family history group. Joined the National Genealogical Society. 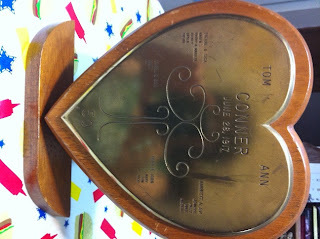 Created family history gift items. Told others about a disturbing family secret (but not all of the secrets). Think genealogy is a passion and/or obsession not a hobby. Have found many relevant and unexpected articles on internet to “put flesh on the bones”. Have an ancestor who came to America as an indentured servant. Have an ancestor who fought in the Revolutionary War, War of 1812 or Civil War. Can “read” a church record in Latin. 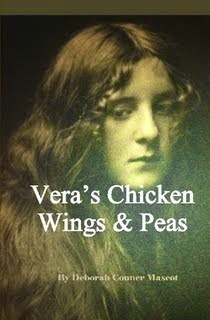 Have an ancestor who changed his/her name, just enough to be confusing. Done genealogy research at a court house. Borrowed microfilm from the Family History Library through a local Family History Center(s). Found an ancestor in an online newspaper archive. Have visited a NARA branch. Have an ancestor who served in WWI or WWII. Found a bigamist amongst my ancestors. Taken online genealogy (and local history) courses. Consistently (document) and cite my sources. Have an ancestor who was married four times. 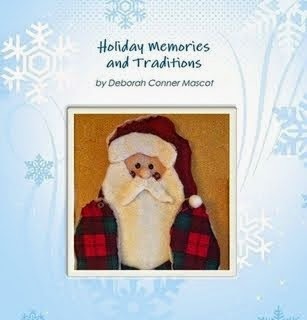 Published a family history book. Learned of a death of a fairly close family relative through research. Submitted articles for FamilySearch Wiki. Used Archives in countries where my ancestors originated. Converted someone new to the love of all things genealogy.